The School of Business released a new program for emerging and experienced entrepreneurs at Quinnipiac: the spring semester speakers’ series by The People’s United Center for Innovation & Entrepreneurship. The initiation of this series will help guide the next generation of entrepreneurs at Quinnipiac. Every Wednesday, from Feb. 23 until May 1, there will be speakers coming in to discuss their entrepreneurial experience and share their advice. These speakers include representatives from corporations such as Starbucks, Advanced Systems Resources, People’s United Bank, Investments of Connecticut Innovations and Stanley Black & Decker. “I have, perhaps, a revolutionary idea that the entrepreneurial community on campus is not as well connected to the intellectual capacity of the school,” said Frank McKinney, the Carlton Highsmith Chair for Innovation & Entrepreneurship and director of the People’s United Center for Innovation & Entrepreneurship. McKinney came to Quinnipiac from the Tuck School of Business at Dartmouth last August. Since then, he has initiated the speaker program to encourage entrepreneurs at QU to expand. 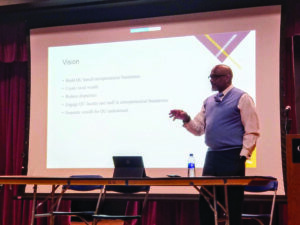 “I’m hoping that our speakers will be able to share their experiences with students and staff at Quinnipiac to let them know what they went through and how they figured their way out of it,” McKinney said. The program is not just for business majors. McKinney recommends that students from all schools at QU come to attend the events. Entrepreneurs and amateurs alike went to the kickoff seminar on Jan. 23. Senior entrepreneurship majors Gabbie Garcia, Suzie Gil and Matthew Gigante were three of many to attend. “I think the biggest thing that people are afraid of is that you have to put in money to make money,” Gil said. Gigante and Gil have already undergone the process of building and maintaining their company, Stoned Cow, an online headshop for bongs and glass blown pipes. They had their own share of tips for people worried about taking the first step toward a startup. Gigante also recommended getting one’s feet dirty in a low risk business before investing in a dream business. Despite the risk that comes with being an entrepreneur, McKinney said that the risk is everywhere, regardless of the industry. McKinney believes that Quinnipiac is the best place for students to start. He said that, upon talking to leaders of the different schools at QU, he found that the faculty was supportive of the venture. The coordination between students in different fields is essential in order for leading edge concepts to emerge. For instance, McKinney explained, if a business major has a new theory for a piece of technology, he/she can best develop it when they work alongside an engineering student who has access to the College of Engineering equipment. McKinney sees a future in the students of Quinnipiac and their capacity to become the next cohort of entrepreneurs. Gigante, Gil and Garcia had a small idea, but they took it to the next step. They are encouraging other student entrepreneurs to do the same. “If you don’t believe in your product, no one else is going to,” Gil said.